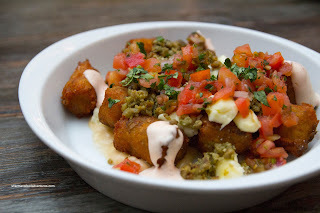 We started with the house-made Tatar Tots with chorizo verde, cheddar curds, queso fundido and kimchi crema. For $10.00, we found this to be smallish in size despite the interesting array of toppings and condiments. Disregarding the price, we found these tatar tots to be fantastic. They were slightly crispy pillows of mashed potato goodness laced by ingredients that offered up a wide range of complimentary flavours. The green chilis added spice and tartness while the crema was cooling. The chorizo contributed a bit of meatiness and the cheese curds were well, cheesy. Next up was the Brussel Sprouts ($7.00) with bacon, cotija cheese, masa bread crumbs. These were much spicier than we had expected, however, I personally liked the kick that lingered after the first bite. 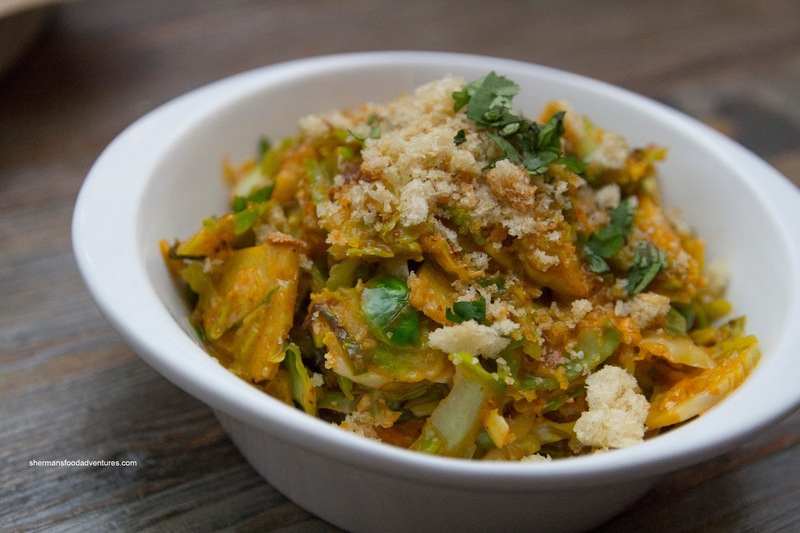 Although the sprouts were tender, they retained a pleasant crunch. Bringing the whole thing together was the smooth and creamy cheese as well as the saltiness of the bacon. Onto what we were really here for - the tacos... Predictably, we ordered a bunch of their popular Fish Tacos. 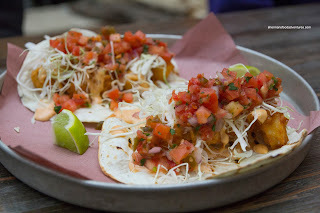 Now some might think that $6.00 is a bit steep for a fish taco, but rest assured, these were of a decent size and most importantly, are money. The large piece of ling cod was fried beautifully where it was just cooked and flaky. 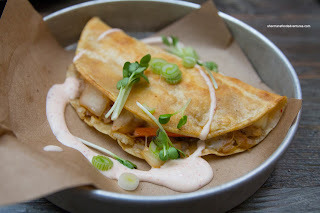 The batter was thin, crispy and light while the rest of the ingredients - shredded cabbage, chipotle mayo and salsa fresca - married well together with a certain brightness and spice. Now drum roll please for one of my top 40 things to eat in Vancouver - the Albacore Tuna Taco. We actually got 3 of these and only one turned out right. 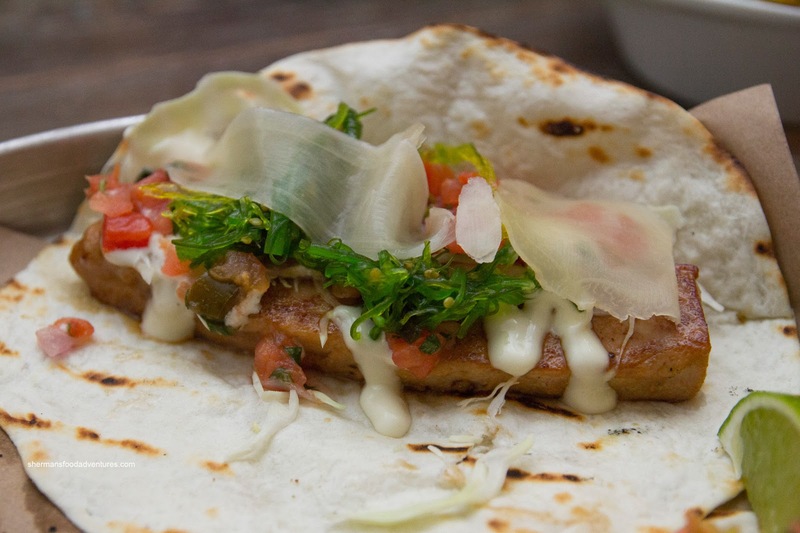 The other 2 featured fully cooked tuna, which lessened the enjoyment of the taco. However, the one that did work out was fantastic as usual. The still-rare piece of tuna was accented by soy, sesame, wakame, ginger, salsa fresca and wasabi mayo. The Asian flavours were powerful enough to add flavour, yet at the same time, not overwhelm the delicate piece of tuna. Unlike the one served from their food cart, this was served with only a light dusting of cabbage. It could've benefited from more for textural and visual purposes. Moving away from fish, we had the Skirt Steak Taco which featured pickled veggies, cilantro and black garlic mayo. The steak itself was cooked a nice medium-rare. Predictably, it wasn't exactly tender, but it wasn't tough either. There was a good amount of char and seasoning. I liked the crunch from the veggies as well as the acidity, particularly from the pickled onion. The spice of the pepper added a good kick while the mayo provided some moisture as well as sweetness. 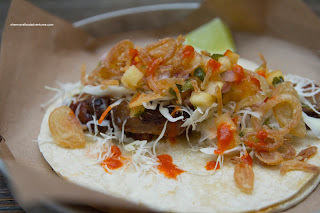 Staying with meat, the Pork Jowl Taco was dressed with cabbage, pineapple, fried shallots and sriracha. The pork cheek was seared crispy on the outside while the meat was fatty and full-flavoured (a touch salty though). The sweetness of the pineapple cut through some of the heaviness whereas the modest amount of sriracha added just enough heat. I loved the fried shallots for their texture and aroma. With 2 more meat tacos on the menu, there was no choice but order those as well. The Gringa consisted of pork al pastor, cheddar curds and kimchi in a fried tortilla finished with chipotle mayo. The crunch from the fried tortilla was a nice contrast to the cheesy, shredded pork mix. The kimchi added even more crunch, yet was too mild for my tastes. It could've been spicier. 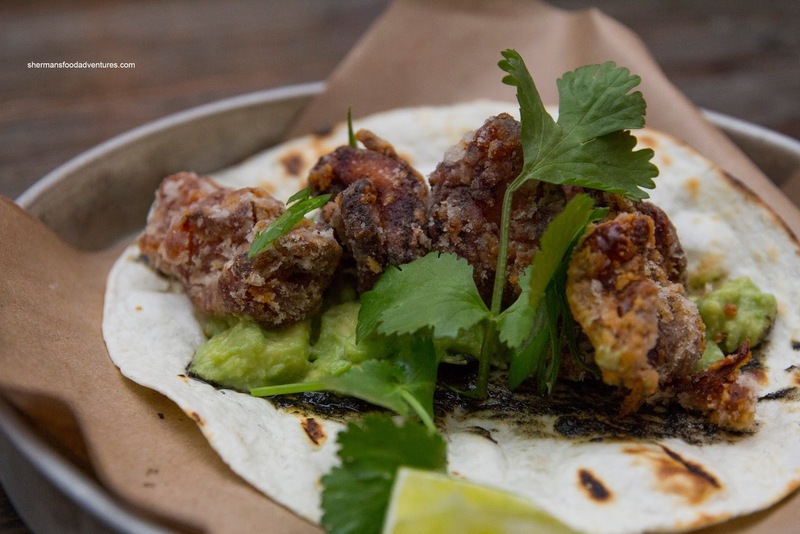 Our last meat taco was the Chicken Karaage with avocado and black chili oil. The chicken was moist with only a light crispiness on the outside. The flavours were balanced with only the slightest hint of spice. This could've benefited from some acidity, maybe from some lemon. And just to change things up, I decided to get the Crispy Potato as our lone vegetarian taco. Hidden underneath the cabbage, queso fresco, cheddar and salsa fresca was essentially a potato mash. 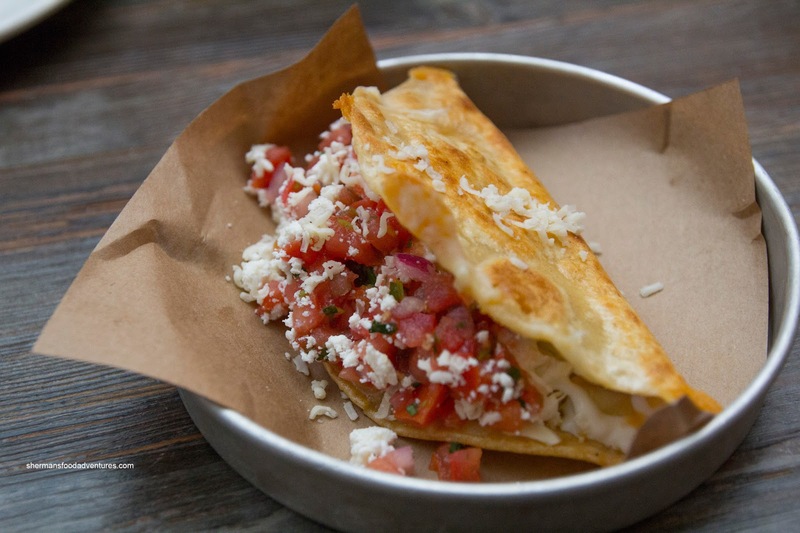 Hence, the fried tortilla was essentially for texture. 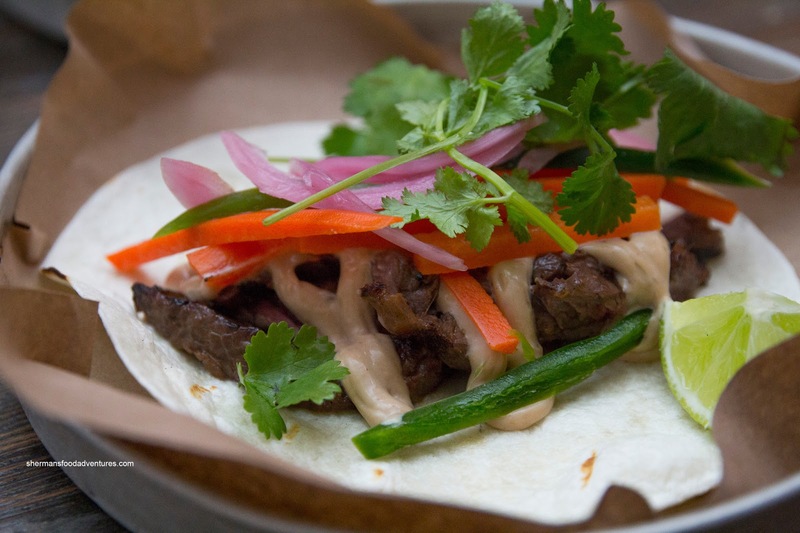 This was decent for a non-meat taco. 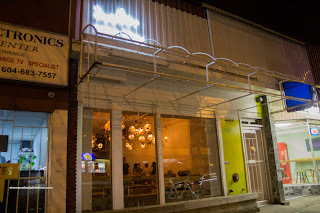 At the end, we were pretty happy with our eats, despite the spending a good amount of money. We thought the food was good, but I'm sure some will find it expensive. This place is too hipster for me. I prefer the truck which has better prices. Yes! Kill all hipsters! They are so annoying! What do they do again? Wear Turtle necks and have Iphones? I think its hip to hate hipsters! Am I hip yet? Oh crap, Im going to kill myself now!